I have to admit that football holds little interest to me. 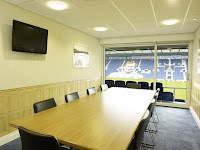 However, when I was asked to decorate the executive box of Preston North End Football Club’s majority share holder, I was somewhat intrigued; Both myself and a colleague worked Lincrusta magic on a blank canvas of a room; Below the dado Georgian Panel RD1650, above Crichton RD 1805 and border RD1640. Crown oil based eggshell was used for Crichton and artist oil colours for Georgian Panel – this was then grained to give a “beechesque” feel. The client was delighted, both inside and outside the box – the deadline was met in time for the first match of the season… and Preston North End won! This entry was posted in Uncategorized on October 7, 2012 by mjguestltdblog.